Despite the franchise that grew up from director Ridley Scott’s epic film, Alien, which debuted back in 1979, it’s worth remembering that Scott, for good and bad, only ever directed the original movie, and that’s fairly obvious once you watch his latest venture into the Alien universe. While Alien was a tremendous film for the time, it was only the best film in the franchise until James Cameron released Aliens in 1986, and Cameron’s film is still the best of the franchise to this day considering Prometheus is a technically stunning science fiction film with a script that I would call boring at the best of times. As a prequel, which is the only thing I can call it since it so closely mimics its predecessors, Prometheus begins close to 100 years before the events of the Alien and Aliens movies, in the year 2089 as two archaeologists discover proof that aliens they call the “Engineers” came to the planet and helped create life. Using symbols that represent star coordinates, Elizabeth Shaw and Charlie Holloway, played by Noomi Rapace and Logan Marshall-Green, work with dying industrialist Peter Weyland, played by a heavily makeuped Guy Pearce, to send a ship to what they believe is the home of the Engineers. With a big team of specialized workers, we catch up with the ship Prometheus as it lands on the planet, and discover that there must have once been creatures on the planet, but now it is dusty and dead, aside from huge mounds that remain behind, holding secrets to humanity’s progenitors, and what must have happened to them. 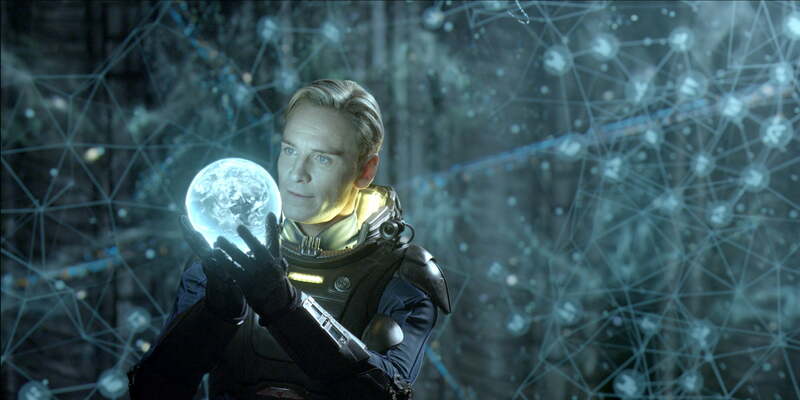 As the team digs deeper into the secrets, events definitely do not go as planned, and Elizabeth and Charlie realize that Peter Weyland’s android, David, played by Michael Fassbender, may be their only key to finding out what really happened on the planet since he has been programmed to figure out the Engineers’ language and knowledge. They will also discover though that David has his own agenda, and he places more importance on his mission than theirs. Unearthing secrets, the scientists and their android will risk releasing something far more dangerous to humanity than they could have imagined, and it will come down to each of them to help stop the frightening consequences. 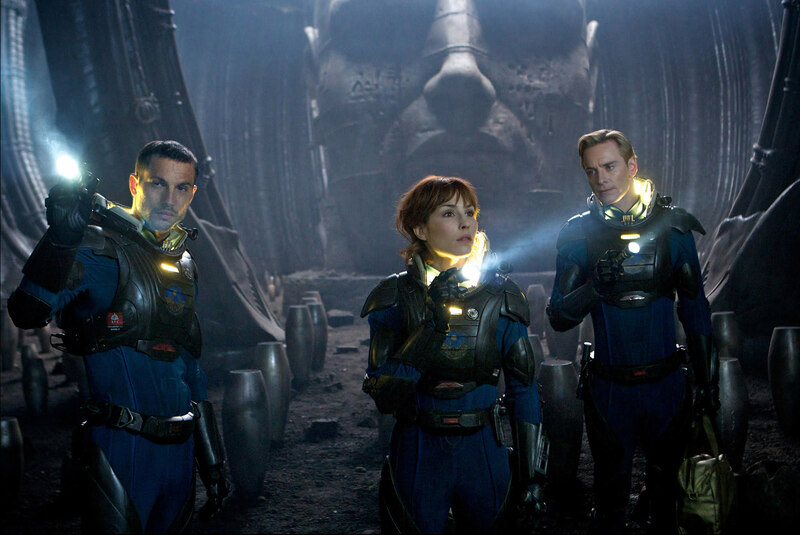 Prometheus is a vivid experience with a haunting style that forebodes death and destruction, but it never fully makes you feel like any of those things are all that terrifying. The images are impressive, but they’re simply not all that terrifying. Scott invests the film with a dark mood, but aside from one scene that I would call frightening, and perhaps unnecessary too–except that it proves Elizabeth’s ability to survive at all costs–the film lacks any real scares or horror. Other unnecessary elements include a number of characters, who are never really used to the story’s fullest, including Charlize Theron as an almost autonomous Meredith Vickers, and the whole concept of burying actor Guy Pearce in makeup when an older actor could have just as easily been used in the part. Disappointingly, Scott rarely found a way in the film to make his characters stand out, aside from Fassbender, who stands out dramatically against the film’s drab storytelling, and Rapace, who did not make me love her, but did more than her share in making the alien threat in Prometheus believable. Fassbender and Rapace deserved better roles though, and if it wasn’t for his skill as an actor, it would be easy to imagine David as just another dark and twisted android in yet another sci-fi film. Featuring the cinematography of Dariusz Wolski, I would only recommend the film to fans who are dying for the visuals Scott so beautifully delivers. My warning, however, is that writers Jon Spaihts and Damon Lindelof, failed to make this story feel like anything more than a prequel that started with a good idea, but evolved based on box office dreams, rather than solid footing. Although I am a huge fan of Lindelof, as one of the writers behind television’s Lost, and despite my respect for Scott, I had a hard time accepting Prometheus as the best film that either talent could have put forth. It’s also unimaginable to say that Prometheus is anything except a prequel, despite what Scott was quoted as saying since the storyline ties so explicitly into the other films.